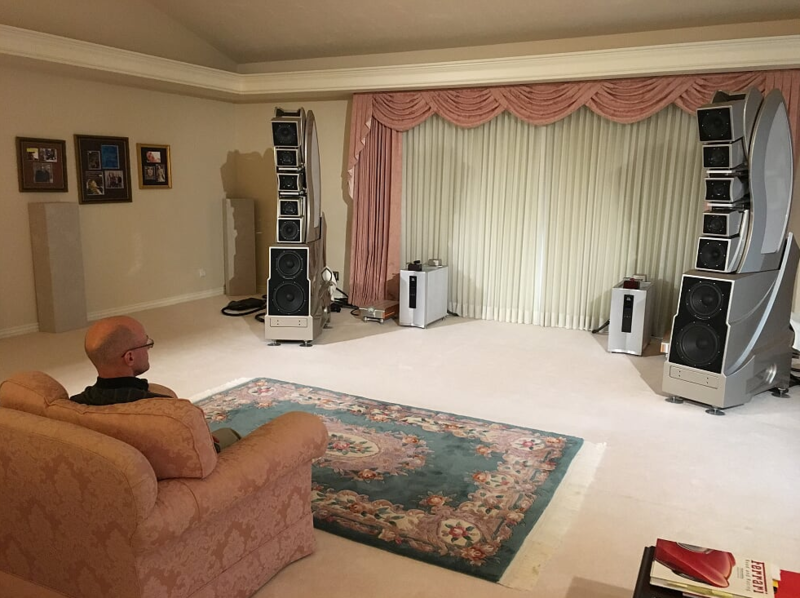 Jacob Heilbrunn and I traveled separately in mid-November to Provo, Utah to hear the new Wilson Audio Modular Monitor, the WAMM Master Chronosonic, one of the most ambitious loudspeaker systems ever created. The original WAMM, introduced in 1985, was a monumental effort at creating a true reference loudspeaker. It pioneered the concept of drivers in separate modular enclosures that could be moved independently to realize perfect time alignment at the listening position regardless of distance from the speaker or listening height. David Wilson was awarded a patent for this technique in 1984. The WAMM underwent several design upgrades over its life until the model was retired in 1997. Now, more than thirty years later, David Wilson has returned to the WAMM. He has spent the past five years conceptualizing and designing the ultimate realization of the original model’s innovations. This time he has the formidable advantages of an additional 30 years of design experience, today’s advances in materials technology and driver design, and the current infrastructure, engineers, and craftspeople of the Wilson factory. Now that David Wilson has officially retired as Wilson Audio CEO (handing the reins to his son Daryl), it’s clear that this loudspeaker is his magnum opus. No stone was left unturned and no expense spared in the quest to build the speaker that would stand as David Wilson’s defining statement. The WAMM’s price reflects the epic nature of the project: a breathtaking $685,000 per pair. Although the new WAMM is rooted in the fundamental concepts introduced in the original, these are now realized with an entirely new level of sophistication. The five-way, seven-driver system employs 12.5" and 10.5" woofers in the ported lower enclosure, with each of the two lower-midrange drivers, upper-midrange drivers, and tweeter in their own enclosure modules. A semi-open gantry-like structure houses and supports the five modules in addition to the complex mechanisms that fine-tune their positions and orientations. In all previous Wilson products with modules, which were also a key feature of the original WAMM, adjustments had been possible only in discrete steps. Now in the new WAMM, the adjustability of these driver modules has been vastly improved. Some of the modules are continuously adjustable with amazingly fine precision (I saw the mechanism in action) to achieve much more accurate time alignment. Wilson says that the new system can align the outputs of each driver to within 5 microseconds at the listening position, and he asserts that this degree of precision is a cornerstone of the WAMM’s performance. Interestingly, this new system’s positional resolution can compensate for variations in group delay at different frequencies exhibited by the upstream electronics. A wide array of new materials and technologies were developed specifically for the WAMM. All the drivers are new. The upper gantry that houses the midrange and tweeter modules is now made from machined aluminum and a new Wilson-developed substance called “W-Material.” This new material is similar to Wilson’s phenolic resin X-Material, but is embedded with thin layers of titanium-reinforced aluminum spaced an eighth of an inch apart. This W-Material is deployed at critical junctions within the upper structure to dissipate vibration. The upper structure, which is designed to be a giant energy sink, is extensively cross-braced. At the factory I saw these substructures up close as they were being manufactured. After the factory tour we made the short trip to David Wilson’s home to listen to this culmination of his life’s work. So, what does a $685,000 speaker look and sound like? First, photographs don’t prepare you for the sheer physical presence of the WAMM. It is at once elegant and technical. With the side grilles covering the upper gantry, the WAMM is a study in graceful flowing curves. Without the grilles, the elaborate module-mounting structure and complex mechanisms for module adjustment are exposed, giving an impression akin to looking inside a high-end Swiss watch. From the listening position, the WAMM’s size is concealed behind the baffle, which is narrower than that of Wilson’s previous flagship, the XLF. I listened to some tracks David Wilson had selected, along with some LPs, CDs, and SACDs I had brought that I know very well. I was also familiar with the analog and digital front-ends: a dCS Vivaldi 2.0 for disc playback and a Basis Inspiration turntable with a Lyra Etna SL cartridge for LPs. We also listened to the original analog mastertape of David Abel and Julie Steinberg, played back on the same John-Curl-modified tape machine used to make the recording. This piano and violin duet, recorded by David Wilson and released originally on LP and more recently on hi-res download, is well known as one of the best (perhaps the best) recording of these two instruments. Starting with the Abel/Steinberg, I have to say that this was the most realistic reproduction of music I’ve heard in my life. Yes, it had the advantage of being sourced from the original mastertape, but that fact alone didn’t fully account for what I heard. The violin was reproduced with such tonal richness and detail, spatial precision, and above all, a startling presence. The piano’s transient attacks were vividly alive, just as you hear from the instrument in life. The clarity was striking. Significantly, the massive WAMM got the physical scale perfectly correct; many mega-speakers sound overblown and artificial with smaller-scale music. In short, the WAMM reproduced these two instruments with an “in the room” realism that I simply haven’t experienced before from recorded music.